In 1950, Ernest Hemingway was the most famous writer in the world, and he faced intense expectations for a masterwork to follow up his epic For Whom the Bell Tolls, published a decade earlier. The novel that emerged, Across the River and into the Trees, was a chronicle of the final days of the cantankerous American colonel Richard Cantwell, who spends his weekend leave in Venice hunting ducks, enjoying the city, and spending time with his beloved teenaged Italian contessa, Renata. This work elicited everything from full-throated praise to howls of derision and outrage. Sixty-five years later, it has been consigned to the margins of Hemingway’s legendary career. Through this exhaustive reading of Across the River and into the Trees, Mark Cirino shows that we cannot disparage what we do not understand. With this novel, Hemingway is at his most allusive and opaque, and Cirino unpacks Hemingway’s vaunted iceberg theory, in which the majority of a text’s substance remains submerged, unspoken, and invisible. Hemingway makes constant references to his own life, friends, and families; other artistic works; the history, politics, and culture of Venice and America; and he draws from his more celebrated works of fiction. Cirino traces the complex web that left many of the novel’s readers confused. In Across the River and into the Trees, the classic Hemingway themes emerge: the soldier after the war and the function of love amid the bloody twentieth century. We learn about the conflicting roles of the soldier and the artist in society and the way a man can struggle to be human and humane to those around him. Reading Hemingway’s Across the River and into the Trees is the premier work devoted to the novel. 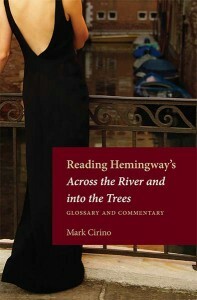 Although Hemingway’s book has been relegated to the corners of twentieth-century literature, Cirino’s exegesis offers a new perspective on the work, at once reintroducing the novel to aficionados, introducing it to new readers, and deepening our understanding of Hemingway’s more famous works. AuthorMark Cirino is associate professor of English at the University of Evansville. He is the general editor of Kent State University Press’s Reading Hemingway series and a contributing editor to Cambridge University Press’s Hemingway Letters Project. He is the author of Ernest Hemingway: Thought in Action and, with Mark P. Ott, the coeditor of Ernest Hemingway and the Geography of Memory (The Kent State University Press, 2009). He is the coeditor, with Carl P. Eby, of the forthcoming Kent State University Press title, Hemingway’s Spain: Imagining the Spanish World.